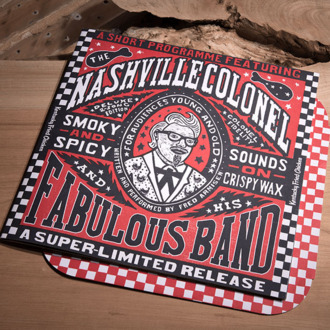 America’s favorite fast-food chicken restaurant Kentucky Fried Chicken appears to have stumbled upon a marketing gold mine when they decided to add food-trendy Nashville Hot Chicken to their menu. Enter “Nashville Colonel” — a younger, sexier iteration of the southern-fried gentleman we know and love, now portrayed by Vincent Kartheiser, a.k.a Pete Campbell — and along with him an entire new persona that is hip, musical, and living in Nashville today. Of course, the next logical step in the marketing playbook was to release an EP of chicken jingles on vinyl, recorded by someone with an appreciation for the Nashville sound who can also grasp the inherent silliness of such an endeavor: Fred Armisen. So yes, there is an extant vinyl EP of KFC jingles written and performed by Fred Armisen. So how to get your greasy fingers on what Stereogum calls “a tremendously limited-edition lathe-cut vinyl record,” which “has been hidden in select record stores across these fine United States”? Well, there’s a map of select stores here, if you’re the type that gets excited about chicken, Fred Armisen, and marketing.